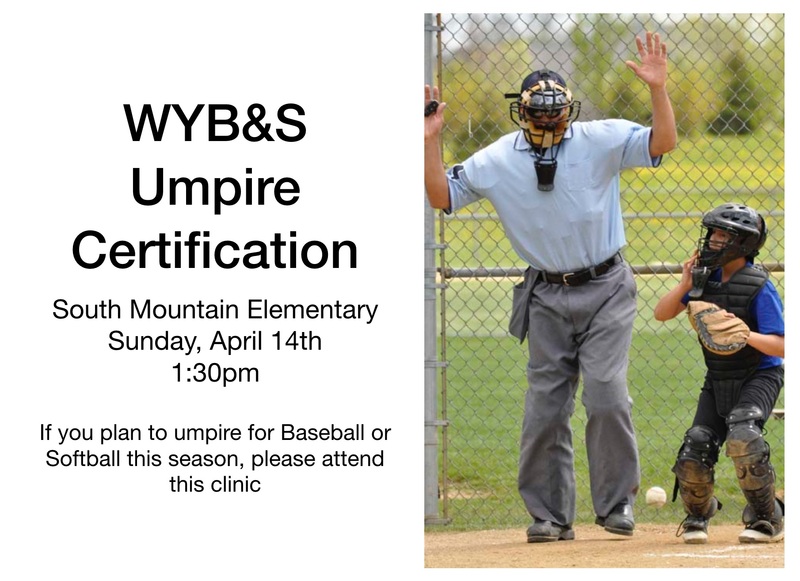 We will have our annual umpire clinic to become a certified fastpitch or baseball league umpire for all levels on Sunday, April 14th from 1:30-5:00pm at the South Mountain Elementary School Gym. Participants that attend this training session will be eligible to receive a $20 Kwik Trip Gift Card for every WYB&S league game 12u or below that they umpire as a token of appreciation from the league. YOU MUST ATTEND THIS SEMINAR TO BE ELIGIBLE TO RECEIVE THE GIFT CARD FOR UMPIRING GAMES!! Baseball umpiring certification has also been added to this clinic and we will have part of the clinic as joint instruction and some separate instruction for Fastpitch and baseball as needed. This is a great incentive for parents to “step up to the plate” and volunteer to umpire games. Fastpitch coaches and Baseball coaches at the 10U and 12U levels are responsible for finding and scheduling their own umpires. It is our hope that this program will encourage parents and siblings of players to learn more about the art of umpiring and be more willing to umpire games. It is also a great opportunity for siblings of our players to earn some extra spending money for the summer. Children wishing to umpire games must be at least 1 year older than the league that they can umpire for. Meaning that a 12U player, baseball or softball, can umpire 10U softball games and receive the gift card if they go through this clinic. Umpires must be a minimum of 13 years old to umpire 12U games and be a minimum of 11 years old to umpire 10U games. Please contact a division player agent with any questions that you may have about the umpire clinic. Thank you again for volunteering to help provide a quality sporting experience for our players and their families. I hope to see many of you attend this clinic.